Anyway, I found this recipe at the blog of Homesick Texan. Her blog is awesome, yeah, awesome. She also has written a cookbook that you can purchase. My tortillas ended up pretty thick even though I rolled them as thin as I could, they were like flour paper going in the skillet, or so I thought. I will be trying this recipe again, probably the half whole wheat version, and will try to put it through my pasta roller on my mixer. Why didn't I think of that last night? Who knows, it actually just occurred to me while I am writing this. Brilliant! 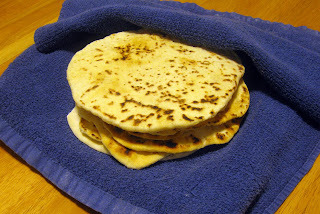 I did have fresh, homemade tortillas with no shortening or lard in under an hour though and they were soft, fluffy, and delicious. My husband made a sort of tacos from them with the black bean and mushroom filling and I made a sort of pizza with the filling, sour cream, cheese, and salsa. It was delicious and I'm super excited about having some leftover tortillas in the refrigerator today to eat. Yum! Happy Tortilla Making! 2. Knead for two minutes on a floured surface. Dough should be firm and soft. 5. 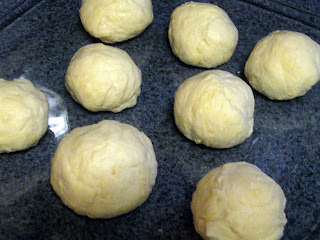 After dough has rested, one at a time place a dough ball on a floured surface, pat it out into a four-inch circle, and then roll with a rolling pin from the center until it’s thin and about eight inches in diameter. (If you roll out pie crusts you’ll have no problem with this.) Don’t over work the dough, or it’ll be stiff. Keep rolled-out tortillas covered until ready to cook. 6. In a dry iron skillet heated on high, cook the tortilla about thirty seconds on each side. It should start to puff a bit when it’s done. 8. Can be reheated in a dry iron skillet, over your gas-burner flame or in the oven wrapped in foil. 9. While you probably won’t have any leftovers, you can store in the fridge tightly wrapped in foil or plastic for a day or so.